What do you do with the bottom feeders in the maritime industry, the shipowners who repeatedly, knowingly fail to pay crew for work they have completed — to the tune of millions of dollars owing every year? Collecting back wages for seafarers on flag-of-convenience ships is one of the important jobs of our ITF inspectors. Totals for 2014 show the International Transport Workers Federation collected $59.46 million in unpaid wages. That’s almost $60 million last year, cheated from seafarers who worked more than eight hours a day, seven days a week, 365 days a year — some of those days for as many as 12 hours. And that’s just the money we found out about. In Canada, our three inspectors collected $864,713 of those unpaid wages last year in ports across the country. This year so far, we have collected $678,528. It’s worth noting that these are the ships that operate in unsafe ways and that pose a risk to our marine environment — the ships that Stephen Harper and his Conservatives want to invite to take over what’s left of our Canadian-registered coastal trade. 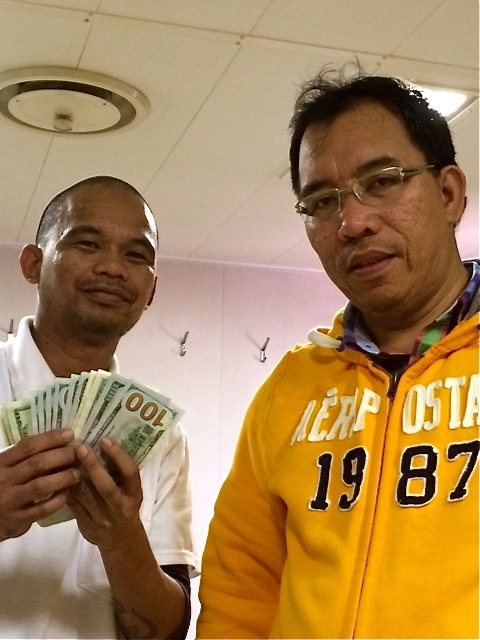 Back pay collected and returned to seafarers is just one aspect of the ITF inspector’s job. We also ensure that seafarers’ health and safety needs are met, including sufficent food of good quality, and that they get medical attention as necessary. And we make sure that they are repatriated at the end of their contracts; to save money, shipowners tend to keep people aboard months after the expiration of the employment period, which could mean well over a year aboard.